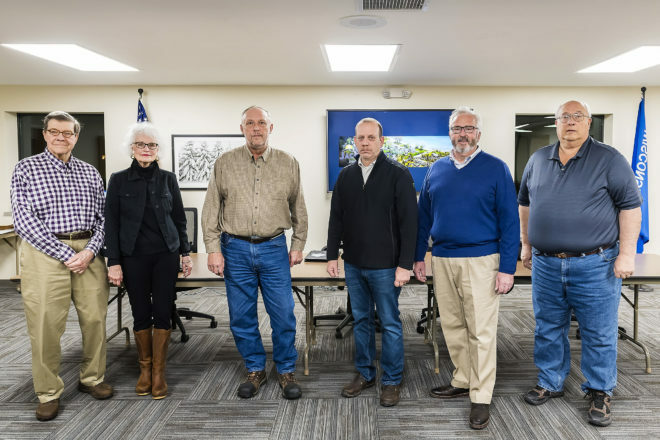 The members of the Building & Grounds Committee, who brought the new town hall to fruition under budget, are, from left, Tom and Virginia Maher, Town Chair Randy Halstead, committee chair and Fire Chief Tom Ash, Les Kiehnau and Clyde Hutchinson. Photos by Len Villano. 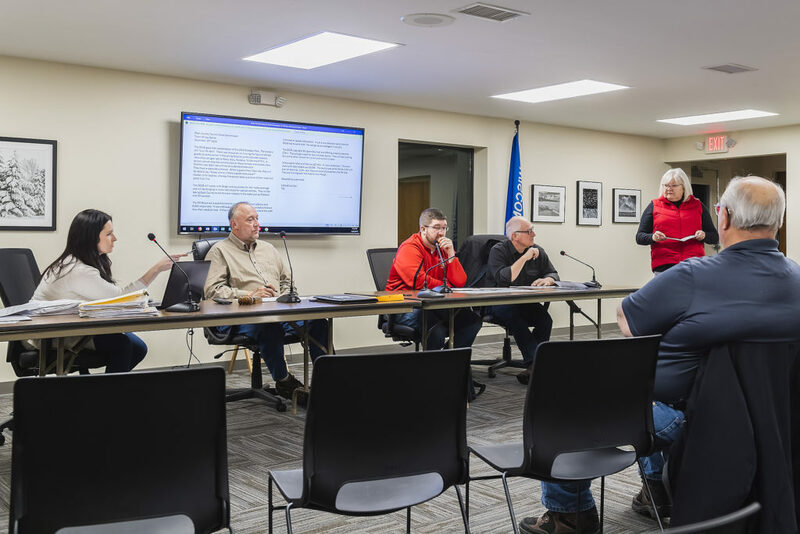 On a snowy January night, the Jacksonport Town Board held its first meeting in the newly remodeled town hall and fire station. Maher pointed out that the project has been underway for four years, and during the process the committee reviewed 42 proposed designs before it settled on what will be shown off to the public during an open house from 1 to 4 pm on Saturday, March 16. Maher also mentioned that the town is lucky to have such experienced people serving on the committee. “This group of five guys has more than 200 years of professional experience in architecture, construction and business,” he said. Committee Chair Tom Ash also serves as the town fire chief, but, Maher said, Ash’s day job is as project manager for Northeast Asphalt. Les Kiehnau was one of the owners of American Appraisal. Clyde Hutchinson was a building inspector for the City of Milwaukee. Town Chair Randy Halstead is a fourth-generation farmer who single-handedly farms 600 acres. And Maher owned his own architectural firm for 50 years. Maher’s wife, Virginia, an art historian, got involved in the aesthetics of the building’s wall colors and art. The town was already in possession of historic photos by Jacksonport photographer Fred Erskine (1890-1987) and decided to complement those with modern works by Jacksonport resident and Pulse/Door County Living photographer Len Villano, who opened his portfolio of Jacksonport photos to Maher. She selected a series of gorgeous photos that Villano then converted to black and white to match the Erskine photos, printed on metallic paper and donated to the town. The only color print by Villano hangs in Town Chair Halstead’s new office. It depicts a double rainbow arcing over a chunk of land Halstead farms. Historic first meeting in Jacksonport’s new town Hall. January 22, 2019 in Jacksonport, Door County, Wisconsin. Photo by Len Villano. “How fortunate it is to have two talented Jacksonport photographers, each representing a different century, zooming in on the water, sky, forests, landscapes and people of Jacksonport,” Maher wrote in a piece about the photos on display in the new town hall. Halstead recently gave a tour of the building. “Everyone who comes in here can’t believe how it looks,” he said proudly. “We’re getting into the 21st century here,” he said as he pointed out the big-screen TVs that he bought at a very good price from his former Door County Board of Supervisors colleague Steve Sohns of Hammersmith TV in Sister Bay. The new furniture in the building also came through Halstead’s connections as Jacksonport’s representative on the Door County Board of Supervisors. The town tapped Jacksonport business Carpet One for the carpeted areas of the hall and took the advice of the Bjarnarson brothers at Island Fever to use Protect-All on noncarpeted areas. “They use it in their kitchen and recommended it because it’s so easy to clean,” Halstead said. Halstead praised the expertise of the building committee and is proud that the project was completed below the $1.4 million budget. In addition to more space for fire department’s equipment, the department now has a new physical-fitness room. Other improvements include a conference room where the town board can go into closed session without kicking people out of the town hall, and a soundproofed partition that separates the main town hall meeting room with what is mainly used as the fire department training room. The partition can be removed for larger town hall meetings and other events. “That’s one thing we did not want to skimp on,” Halstead said of the partitioning. The expanded kitchen was furnished with appliances donated by the Jacksonport Women’s Club, which uses the kitchens for some of its functions, including making kolaches for the annual Maifest and Cherry Fest held in the town. In addition to the open house to view the nearly 5,000-square-foot town hall, Jacksonport is in the planning stages of its sesquicentennial celebration on Aug. 10. Plans are to have polka music by Jerry Voelker during the day and the band Copper Box performing in the evening. There will be a fish boil, roast pig and other food; a fireworks display at night; and tours of the new town hall and fire station.